You notice how I’m not really smiling? Think I wondered what I got myself into! 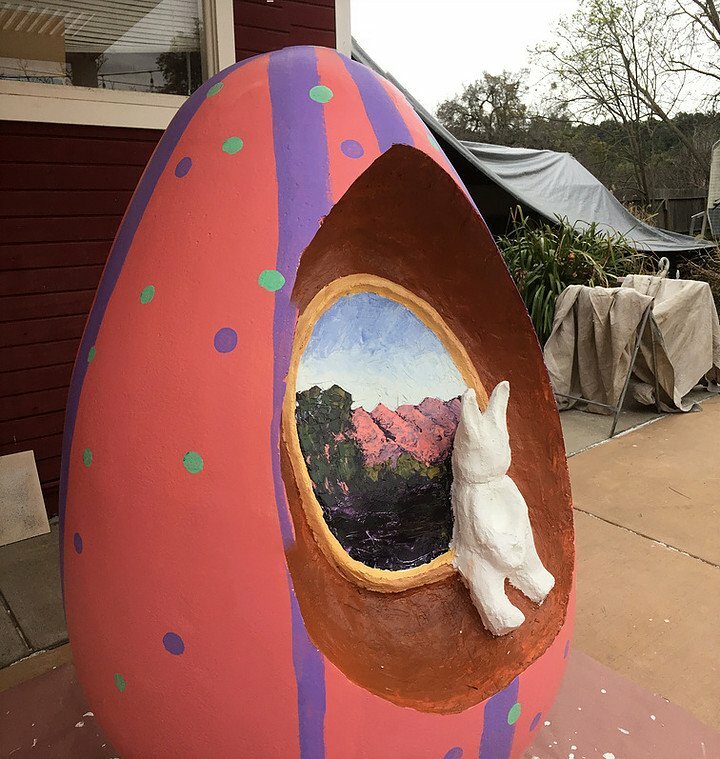 I originally was going to paint a “serious” Pink Moment egg — it was going to cover the outside. But…I got the idea to carve into the thing. It wouldn’t fit in my studio — at it’s widest, it’s 60″ around and 5′ tall. But, it actually ended up being a good thing, the Styrofoam went everywhere…stuck to my clothes, my hair, flew around my yard. I did wear a mask to protect my lungs. I used to carve in stone, but as I discovered (what was I thinking trying something new?!) Styrofoam was a little different. But not as different as I thought. I was getting very frustrated, had trouble digging in there — had an electric knife (thank you Joanne Pavlak!) and that worked for part of it. 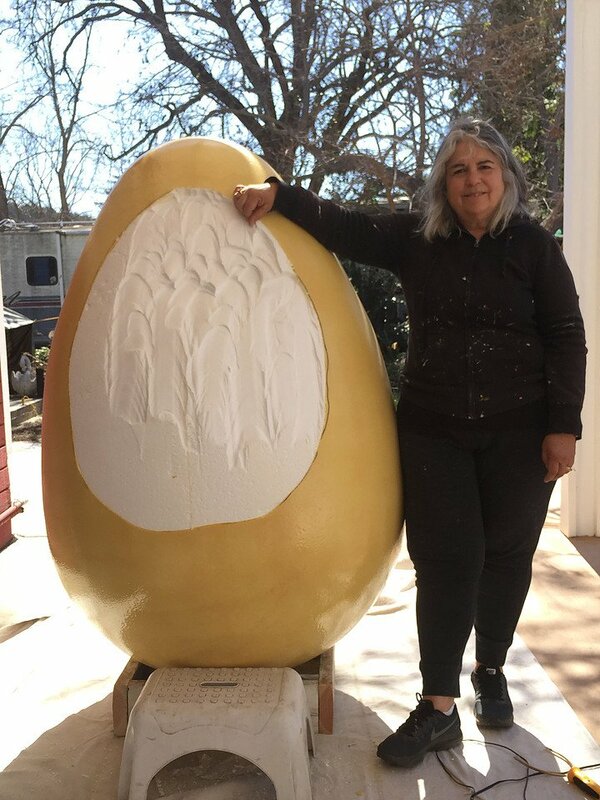 But, Ojai Rockstacker Martha Moran came to the rescue and brought me real sculpting tools — what had taken me two weeks I ended up finishing up the carving in a day. And…not a day too soon! Rain was predicted (in Southern California?!) and frankly, we can’t complain about rain (waaahh!). Have a lot painted…you can tell the clouds are heavy with incoming rain. So, carving done, Went to town, got the outside painted and put this stuff on the Styrofoam so I could paint on it with looking holey. I started painting the Pink Moment – with my trusty palette knifes. Didn’t like the brown color inside the egg, so changed it to blue. A few more touches needed before it was done. 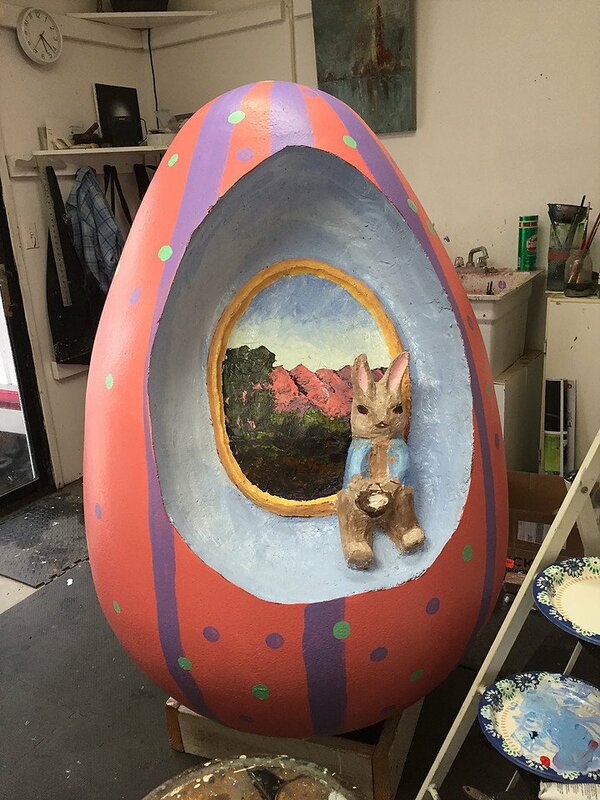 So, meanwhile, the doors were taken off my studio and with no help from me…my egg was moved in my studio. Delivery day to the Ojai Valley Inn and I was in a walking cast. 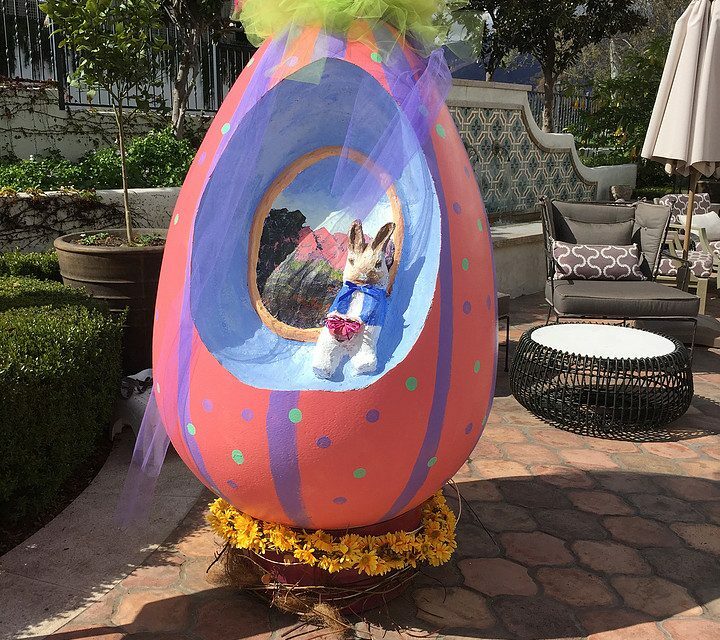 Well, Martha Moran, Fred, Norman and Tanya Kovaleski came to my rescue and delivered my egg to the inn. 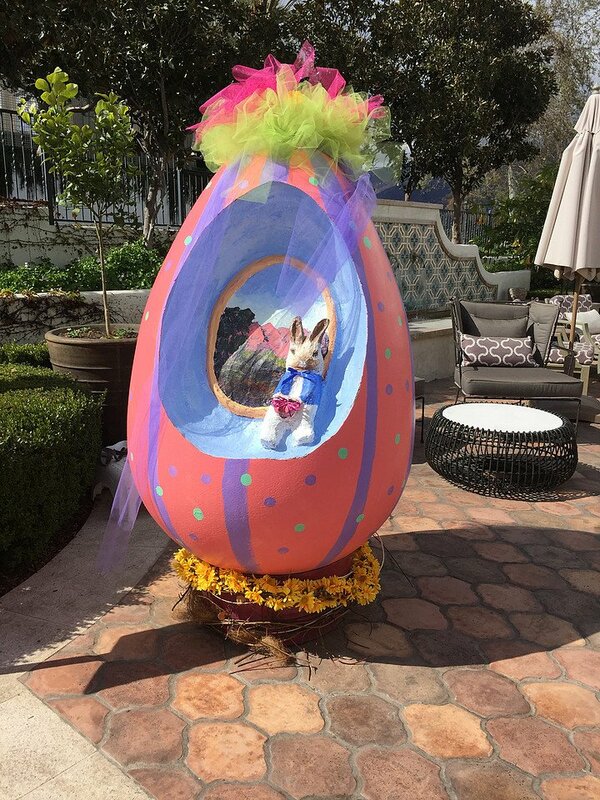 Well, here it is…my egg. 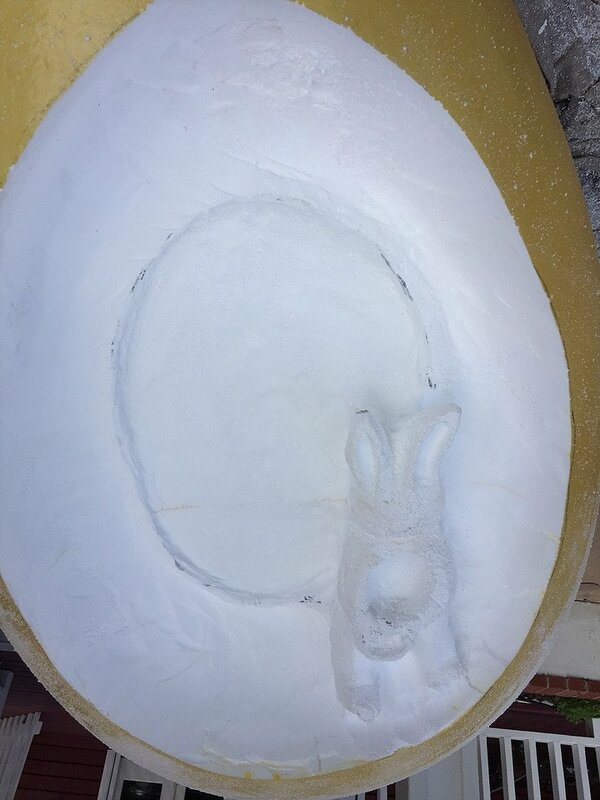 It’s no 2 and has been moved to the art cottage area if you’d like to see it and other eggs in person.